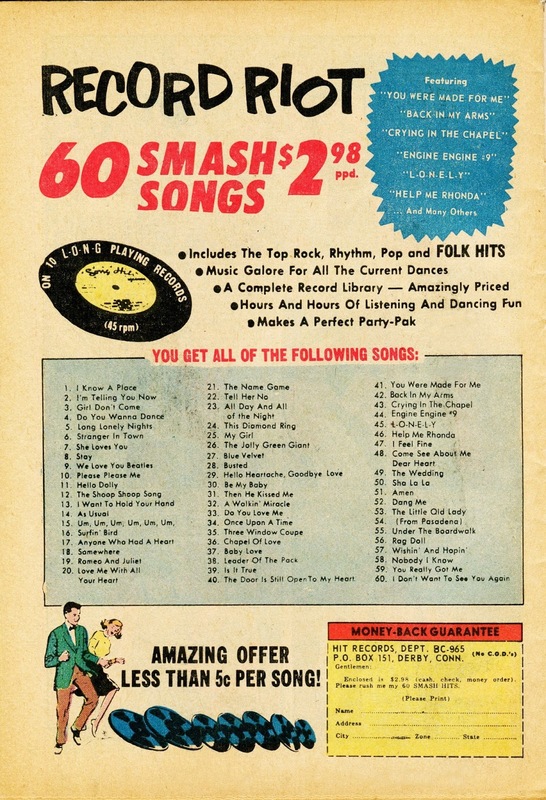 Music You (Possibly) Won't Hear Anyplace Else: Fake hits from the sixties, Part One!! 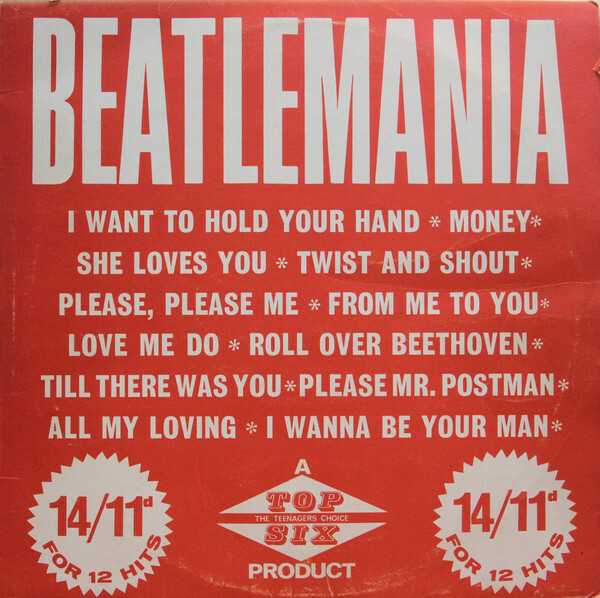 Fake hits from the sixties, Part One!! And labels like Hit Records, the U.K. Top 6 EPs and LPs, Arc Records, and the Columbia Record Club. 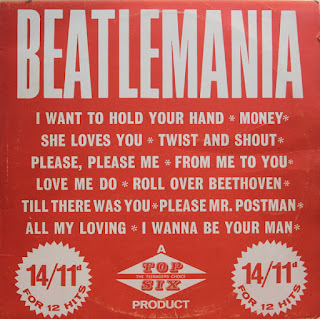 The performances range from outstanding (the unnamed group on the Top Six Beatlemania LP--can't recall who they were) to dreadful (the Hit Records/Modern Sound covers, and some of the Song Hits/Hit Parader efforts). I inadvertently duplicated some Hits of To-day tracks from last post--oops! But they're worth hearing twice, especially in the company of other fuax fab four performances. 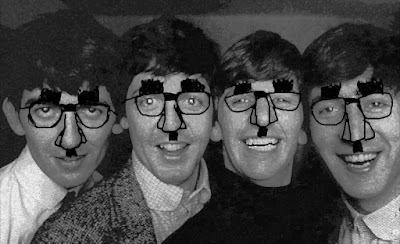 We Love You Beatles was a novelty hit by the Carefrees, Bad to Me was a Lennon-McCartney hit for Billy J. Kramer and the Dakotas, and World Without Love was a Lennon-McCartney hit for Peter and Gordon, all 1964. The Hit Parader 39 Michelle is a copy of the 1966 David and Jonathan version. I honestly don't know. Maybe the basic cheap-label marketing scheme--twenty hits for the price of three, or whatever--was gold. I would have expected this gimmick to have lost a lot of steam by the time the Far Four arrived, because we like to think the kids were hip to the original artists and weren't about to settle for a counterfeit performance. But maybe the kids weren't that hip, after all? It's a possibility. I have to wonder, because fake hits sold into the 1970s. Not in numbers comparable to the 1950s and early 1960s, but they sold. Another thing to consider is limited spending cash. Suppose that, by 1963, there were youngsters who would have loved to own the real versions but, being cash-strapped, opted for the cheapos. Lots more music for the same money. There's the all-or-nothing media history stereotype that Boomers had dough to spare, but I was a Boomer, and I sure as heck didn't. The thing is, there were way too many fake hits produced in the sixties for a decent-sized market not to have existed, so someone was settling for these things. The evidence doesn't match the narrative (namely, of kids being too hip for surrogate singles and LPs, come 1964), so there's something wrong with the narrative. I follow the rule that the evidence is always right. By the way, as much as I joke about the time and attention I devote to questions like these (such as, who bought the fakes and why? ), they really are important issues in that they puncture a good-sized hole in the conventionally accepted narratives. I feel very strongly that the media does an awful job documenting its own history, and there are scores of pat pop-music theories that have been allowed to stand, unchallenged, for way too long. Actually, it should be "stand unchallenged for way too long." I'm one of the few people on the planet who uses too many commas. I need to get with it--commas are becoming extinct. And semi-colons? What are those? Gulp. Semicolons. I overuse hyphens, too. I'm hopeless. 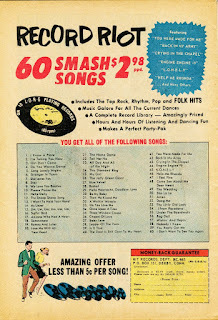 Consider that for many years prior to these sixties songs in question, there were a dozen or more versions of a song fighting it out on the charts for a share of the money. Unsophisticated listeners might have known there was a version they liked more than another, but they would have had to be paying a lot of attention to know it was Benny Goodman instead of Joe Venturi. And different radio stations or juke boxes played different versions. It's almost as if the song was the attraction, not the performance. I think that attitude took a long time to change, and it started doing so in the early sixties as rock began to assert itself. So the volume of these fake hits began to decrease. Make sense? Yes, I agree, absolutely. You're right--with rock, it became the recording much moreso than the song. It's just that this change was a longer time coming than the traditional rock history narrative maintains. The media's story of rock is the usual simplified popular narrative.